“Wonders do come in small packages!” - Bestowed with a numerous achievements and awards the state of Sikkim is hailed as a land of peace and tranquility. Mt. Khangchendzonga, the world's third-highest peak is revered by the people of Sikkim as their protective deity and is located on Sikkim's border with Nepal. And what variety in such a small state: plunging rhododendron-clad mountain valleys in the north, West Sikkim's atmospheric Buddhist monasteries, monumental religious statues in South Sikkim and friendly and cheerful urban centres in the east. Awarded the cleanest state in India, Sikkim welcome you to an unique sub-tropical to alpine experience in the Himalayas. Sikkim is a popular tourist destination, owing to its culture, scenery and biodiversity. Little wonder that this tiny former Himalayan kingdom is such a haven for travellers. Once a monarchy under the Namgyal dynasty, Sikkim was fully integrate into India in 1975. The state has a rich Buddhist history where the renowned Buddhist Guru Padmasambhava is said to have visited. 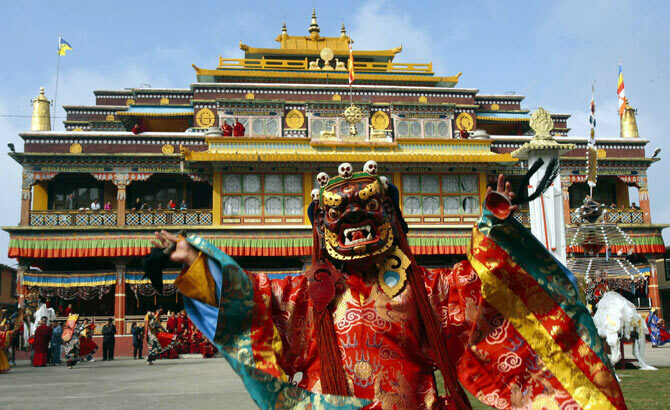 You may experience Sikkim in various ways to make your own travel experience. From leisurely strolls in the hills to long treacherous treks & mountaineering, from Yak rides to Bike rides, Birding, Angling, Wildlife.... the adventure awaits! Gangtok: The capital city of Gangtok is the prized crown of this state. A litter free M.G. Marg, a ropeway, a resounding night-life and a casino are just a few diverse experiences that awaits you here. Buddhist Monasteries: Sikkim is also known as the land of monasteries a few grand and important monasteries are Rumtek, Pemeyangtse, Tashiding, Echey monasteries. Their grandeur can be best experienced during festivities. Nathu-La, Tsomgo Lake & Baba Mandir: Towards the east Nathu La is the border point of Sikkim with China. Tsomgo Lake is a spectacular high-altitude glacier lake that remains frozen for the most part of the year is just short of Nathu-La. Baba Mandir is mystical shrine dedicated to an Indian Army soldier “Baba” Harbhajan Singh who is believed to be still in service even after his demise. Yuksum: a holy town enveloped in the sublime beauty of nature is a call to the trekkers to wander in this Himalayan wilderness. Lachung, Lachen & Yumthang: The serene natural beauty of the North Sikkim is awaiting to be explored. The high altitute Gurudongmar Lake is one of the world's highest lakes located here. Zuluk: Located on the ancient ‘Silk Route’, the twists and turns of the hilly roads, the magnificent scenic beauties of Zuluk is fast becoming a tourist hotspot where the warm hospitality of a homestay awaits. Namchi & Ravangla: A famous religious tourist spot with giant statues of Buddhist and Hindu relevance. Pelling: Greenery, Monasteries & the ruins of Rabdentse - the erstwhile capital of Sikkim. The Kanchenjunga Falls is another attraction for visitors. Temi Tea Garden: The best Tea Garden of Sikkim. The natural beauty of Sikkim and the warm hospitality of its people are sure to remain with you throughout your life.